Our attractive, school apple red apron will keep your clothes protected from all messes! You will feel confident in our apron with great pockets and black embroidery proudly displaying your status as a Foster Grandparent! 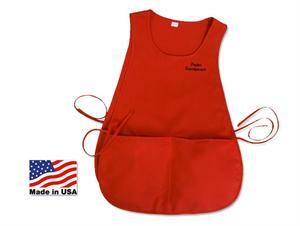 For every purchase of smocks, vests and aprons, Good Deed donates a portion of sales right back to Foster Grandparents! For a quote on additional or alternative embroidery, please call us at 805-640-0242.